Last month, I had the opportunity to participate in the LFA project. For those who don’t know what this is, it’s a ‘four-part course which explores the universal lessons of the Holocaust and its relevance for today’. To truthfully put it, I find it hard, even after a few weeks, to cohesively talk about my time spent in Auschwitz-Birkenau. Even after hearing Ziggy Shipper, a Holocaust survivor, tell his experience in our first seminar, it was all too much for me already. But actually being there helped me to push through the emotional and physical exhaustion because I had to tell myself that if Ziggy and everyone else during this time, wearing only pyjamas; endured the every last bit of turmoil, the least I can do is bare the -5 degrees fully clothed and hold the firm belief that I’d be out by the end of the day. The infamous gate at Auschwitz, which reads Arbeit Macht Frei (“Works Brings Freedom”), was something I had seen in photos over and over again, and yet on that day it was right in front of me. As I enter inside of the camp, I first notice the suitcases. Not one. Not two. Not ten. But hundreds and thousands suitcases piled upon each other. A lump in my throat begins to form as I begin to make my way through the other rooms: There are more. But this time it became more physical – piles of human hair, baby shoes, hair brushes. And I realized these things didn’t appear here out of nowhere. They were brought here by innocent people looking to ‘settle’ but ultimately disappeared. 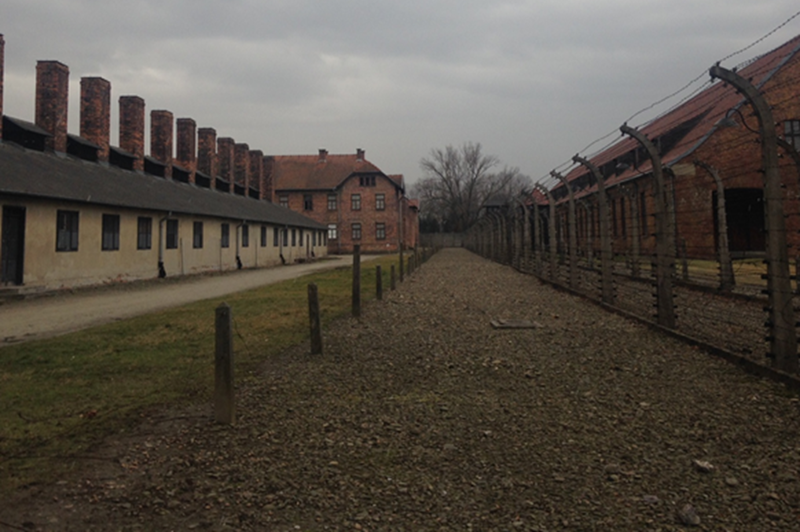 Visiting large parts of Birkenau was for the most part, exhausting. Images from the Holocaust had been ingrained in my mind as long as I can remember. I had been worried that since I watch a lot of documentaries and have studied a lot of things to do about the Holocaust that I’d been desensitized to it. I realized you could never know nor understand enough. There was something about being there that made it more real than even any graphic video footage/textbook could. And I realized that just thinking about the statistics and putting the films into context was just not enough. In all my years as a History student and a reader, I always knew that the Holocaust had happened. I thought I understood what had happened, but I only understood the statistics of the Holocaust. The truth is, we can never really truly understand. What are we able to do than merely grasp the vastness of the camps, or feel upset through reading a book about the great numbers that have been lost? In those big numbers, we must find a way to humanize and come to know that these were once people like you and me. Only then can we start to have some sort of comprehension. I feel as though in some aspects everyone who visits Auschwitz-Birkenau shares a similar undergoing of sadness and distraught. But my sadness wasn’t designed by someone else; it was deeply personal and hard to explain. My overriding memories and the whirl wind of emotions that I try to contain are of the things I saw and the way they now impact me day-to-day. Things that creep up on me when I don’t expect it. For example I would be standing on the pavements in the train station and I would imagine the railway tracks the same as the ones in Birkenau. And I remember bigotry and hatred is what caused the perpetrators to capture innocent people. In the same way, bigotry and hatred is what leads Muslims to be pushed onto the railway tracks in this day. Some may say that ‘what is done is done’ but the lessons of history still remain unlearnt with genocides occurring till this day. Survivors lived through the Holocaust without ever understanding how any members of a nation could indulge in such wickedness. I worked hard in remembering the people and adding elements of re-humanization, not the history or the politics. The people. Now it is up to us to give back. We must ensure that this never happens again. We owe it to Ziggy Shipper. We owe it to everyone and most importantly, we owe it to ourselves.